There were many varieties of protective apparel, but none were proper for primary head protection. By combining fiber engineering and converting technologies, we developed innovative head coverings to meet the safety requirements of many industries. VitaFlex's Soft-stretch Hoods are the innovative PPE addition that provides a cool, comfortable head covering with effective barrier protection. They conform to the contours of wearer's face, securely cover the entire head, face & neck, allow for the freedom of head movement, and maintain its comfortable fits. Protective head covering doesn't usually receive attention it deserves from managers. Many workers wore only a mask when spraying paints or coatings, layering fiberglass, cutting concrete or asbestos-containing materials, removing debris or waste, or sorting scrap. Some harmful substances can be absorbed through skin contact and some are carried on the worker's hair and subsequently inhaled possibly causing incurable illness. Start protection today and start saving. For 50-pk & Bulk case of 400 hoods, go to "Hoods on Sale" page. We reward repeat customers by holding their re-order price to that of their last order during the last 12 months. Retail packs are available at Amazon.com and select Lowe's Home Improvement Stores. Dennis - President ROCKMM Manufacturing, Inc. In a machine shop, deburring parts with grinders is a messy job that often sends small splinters of metal flying. These hoods are light-weight and breathe well. With the covered nose, and safety glasses, very little skin is exposed. This keeps the grindings out of employees', hair, face, ears, nose, and even keeps the particles from going down the inside of their shirt! We've had situations where shavings have fallen out of employees hair and into the eyes well after actually grinding. These greatly reduce that risk and, costing about as much as a disposable dust mask, they are inexpensive enough to just throw away after use. Breathable cool hoods keeps face free from paint and paint free from lint. They also seems to keep me cooler and if I do sweat they seems to hold the sweat and not allow it to drip on my work. We operate a C&D transfer and recycling center. It's a very dusty environment. The folks on our sorting line love the hoods. We can't be without them. Would appreciate a volume discount. I've used other head socks that are more expensive and don't last as long. These are perfect in fit and durability. No gaps for product to get on you. Wouldn't buy any other! Best product of this kind that we've tried. The only reason I did not rate it a 5 is because it still is not as cool as I would prefer. But in all other aspects it is excellent. The multiple-layer fiberweb structure provides a "breathable barrier" which effectively shields against airborne particles, dust, dirt, soot, powder, debris, grease, sparks, liquid splashes, and paint or chemical overspray. It also prevents scratches and sun exposure when working outdoors. One size fits all, soft-stretch, form-fitting, and comforable to wear. Can be conveniently worn with goggles for "light jobs". A dust mask can be worn under or over the hood. Works great as a liner under a respirator, hard hat, or air-fed helmet. It is highly water-repellent. Water runs off like a duck's back. Multiple soft-stretch hoods can be comfortably layered to achieve the desired thickness or barrier effectiveness. 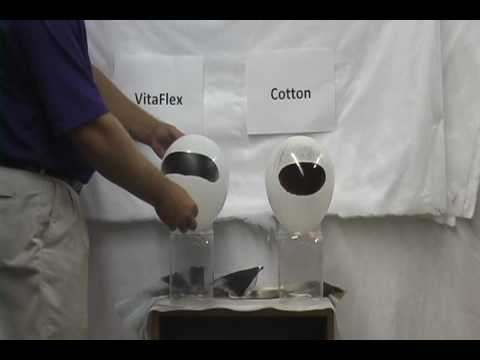 Caution: The VitaFlex Hood is not for replacing a mask when required by OSHA. Not for blocking organic solvent, toxic or bio-hazard gases, fumes, or vapors. Not for blocking pressurized liquid and particles. Not to be used near flames or in an environment of above 200 ˚F.